Jose Mourinho could face a selection headache for the blockbuster clash with Arsenal on Sunday, as all three of his senior Chelsea strikers – Didier Drogba, Loic Remy and Diego Costa- are currently nursing injuries. Drogba delivered a huge blow to Chelsea after he had to withdraw, the Daily Mail report, from his own charity game this week, following the Manchester United victory on Saturday evening, with an ankle injury. The Blues boss could, therefore, be forced into competing against Arsene Wenger’s in form Gunners side with no striker to hassle the Gunners defence, as forwards Remy and Costa also remain on the sidelines. 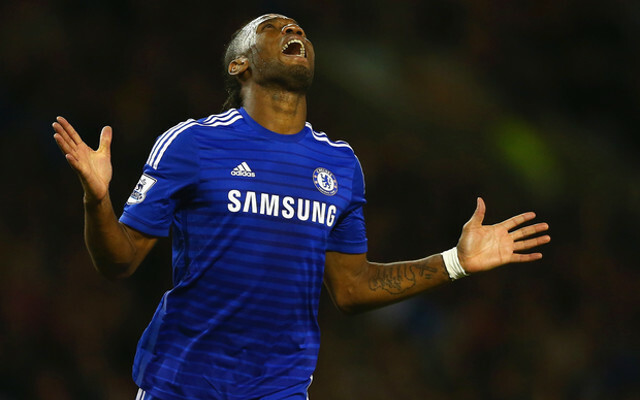 Chelsea have not been unaccustomed over the past few seasons to playing a ‘false no.9’. Andre Schurrle, now playing Vfl Wolfsburg, was deployed up front in last season’s Champions League tie with Paris Saint-Germain. Similarly, former Blues boss Roberto di Matteo opted to drop Fernando Torres in place of Eden Hazard for a forward role in a European clash with Juventus in the 2012/13 season. We expect Jose Mourinho will likely place Hazard in a central role up top with Willian to take up his position on the right flank – particularly with the Belgian high in confidence after netting against the Red Devils at the weekend. While Wenger may be delighted to hear that the title leaders are without a striker – as the formation above illustrates – there will still be plenty for the Frenchman to fear in Chelsea’s attack.